2019 OHL Priority Selection - Final Top 100 Prospects #OHLDraft - Very Barrie Colts | A website covering the Barrie Colts of the OHL. First off, congratulations to the Don Mills Flyers on winning the 2019 OHL Cup. The Toronto Red Wings played an excellent final, but just came up short. The tournament was an incredible event from top to bottom. Congrats to the Don Mills Flyers! It's fitting that the top three prospects teamed up for the winning goal. Excellent lob pass by Brandt Clarke to Shane Wright and across to Brennan Othmann for the game winner. Shane Wright was the tournament MVP and led the tournament in scoring. Below are the top scorers for the tournament and First Team All-Stars. Top #OHLDraft prospect Shane Wright finishes one point shy of @cmcdavid97’s 2012 record. During the OHL Cup, the annual awards banquet was held. The following players were minor midget AAA players of the year for their respective associations. In February, a select group of minor midget AAA players represented Team Ontario at the 2019 Canada Winter Games. Congrats on the silver medal boys! Here is a photo of the squad. OHL Cup Tournament (Toronto, ON) - 8G & 10A for 18 points in 7 games. Shane Wright is a 2004 born player dominating the 2003 born circuit. Exceptional status was granted by Hockey Canada on March 8, 2019. He is the real deal and whatever team (Kingston secured top pick) is lucky enough to draft him will likely get three years of his services (expect him to go to the NHL after his draft year). All the physical tools are there and his hockey IQ is next level. The way he sees the ice, distributes the puck, and attacks open gaps is impeccable. Watch out for the quick wrister mid-level and under the glove. That’s his go to move, but Wright has several tricks up his sleeve. I’ve seen him put the puck in the net almost any way imaginable. Shane had recorded over 150 points by March 6, 2019. He led the Don Mills Flyers to an OHF Bantam Championship last season with 15 points in 8 games. 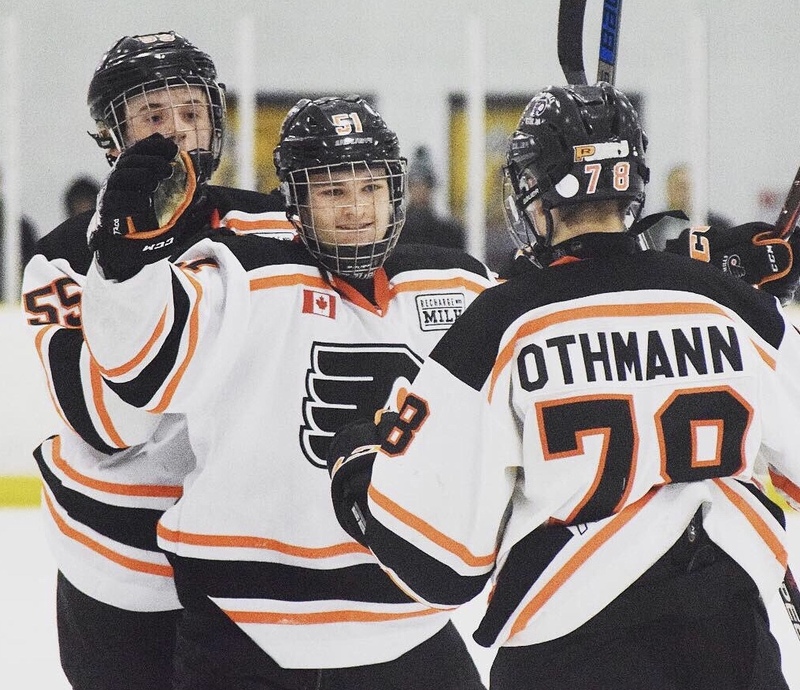 His Don Mills Flyers have only lost one game this season (finals of Silver Stick to Compuware), and they won the Toronto Titans Prospect Tournament and Wendy Dufton Memorial Tournament in dominant fashion. The Don Mills Flyers were tested at the Toronto Marlboros Holiday Classic, but emerged victorious. Shane Wright got the OT game-winning goal in the finals and was named MVP of the tournament. The Toronto Red Wings gave them a very entertaining game in the 2019 OHL Cup Final, but Don Mills won the game and Shane Wright got another MVP trophy. OHL Cup Tournament (Toronto, ON) - 2G & 9A for 11 points in 7 games. OHL Cup Tournament (Toronto, ON) - 8G & 6A for 14 points in 7 games. Othmann is Shane Wright’s partner in crime. He is the perfect complement to Wright and they play extremely well together. Othmann is super sturdy and can bury the puck. His finishing touch is really high-end. Deceptive head fakes and quick hands are part of the equation. Othmann fools goalies and defenders to keep them off balance and on their heels. Brennan had scored over 150 points this season by March 14, 2019. Sasha Pastujov had himself a tournament at the Silver Stick in Whitby. Him and Dylan Duke (see number nine below) had an incredible weekend and wowed those in attendance. The finals with the Don Mills Flyers (5-4 OT win) was an absolute classic. Pastujov displayed a nice wrist shot that found the net frequently. He can change up his speed drastically to keep defenses on their heels and stop on a dime. This kid can really play and his puck skills are special. Check out a goal by Pastujov (wearing #12) from the Silver Stick Tournament (assisted by #25 Dylan Duke) below. Rumors are that Compuware was supposed to send their top players to the OHL Cup. Unfortunately, that didn't happen and Compuware had to back out of the tournament at the last minute. McTavish plays the game with an exceptional combination of skill and power. It's extremely difficult for opponents to knock him off the puck or break his stride. The strength he possesses is mind-boggling for this age group. Mason can also make really nice moves with very little space or room to maneuver. He is like a freight train coming through and he unleashes a very heavy shot off the rush off a quick release. I was behind the glass when he missed a shot attempt and it hit the glass a few feet over. My ears were ringing for a few seconds after - that shot tracks at high velocity. Great point production in the HEO Midget AAA league and seven points in five games at the junior level is impressive. OHL Cup Tournament (Toronto, ON) - 1G & 3A for 4 points in 5 games. AYHL 16U - 27G & 35A for 62 points in 22 games. TIEHL U16 - 23G & 38A for 61 points in 25 games. OHL Cup Tournament (Toronto, ON) - 7G & 7A for 14 points in 7 games. Harrison is a pure game breaker in every sense of the word. He drives the London Jr Knights and has a really powerful motor. Easily a first rounder and must have been a close second to Deni Goure for the Alliance player of the year award. Comments: Winterton is a beast. 200 foot centre who plays a complete game. He stands out on the ice and I don't expect him to drop out of round one. Sirizzotti can flat out score. The numbers he is putting up this season are absolutely insane. He is a very strong play maker and makes really exceptional plays with the puck. He could be the best pure offensive player in the draft with his passing skills and vision. His offensive instincts are incredible and he has a knack for creating scoring chances and moving to the right spots without the puck. These skills come naturally and OHL teams will be very intrigued about his offensive fire power. OHL Cup Tournament (Toronto, ON): 3G & 1A for 4 points in 6 games. USA Hockey Select 15 Development Camp: 0G & 3A for 3 points in 4 games. Toronto Titans Prospect Tournament (Toronto, ON) – 0G & 4A for 4 points in 5 games. International Silver Stick Tournament (Whitby, ON) – 2G & 3A for 5 points in 4 games. Gaudreau is the best goalie available in the draft. It wouldn't surprise me to see him taken at the end of the first round. He was the starting netminder for Team Ontario at the Canada Winter Games and he has all the tools. Quick, athletic, excellent movement in the crease, and body control. If he doesn't go in the first round, expect him to be drafted early in the second. OHL Cup Tournament (Toronto, ON): 1G & 8A for 9 points in 5 games. OHL Cup Tournament (Toronto, ON): 5G & 8A for 13 points in 5 games. OHL Cup Tournament: 5G & 2A for 7 points in 5 games.